Will they want my PR firm as is? In this instance we’re not talking about a new business presentation. This is a question virtually every PR agency owner asks herself or himself when considering the possibility of selling their agency. Will a buyer, any buyer, be interested in what we have to offer now? In this second in a 6-part series of webcasts sponsored by The Stevens Group and brought to you by CommPRO, Peter Finn, Founding Managing Partner of Finn Partners, shares his insights with agency leadership on what he looks for in a seller agency before he either decides to take a pass, or to start taking the necessary steps to integrate the seller’s firm into his firm. 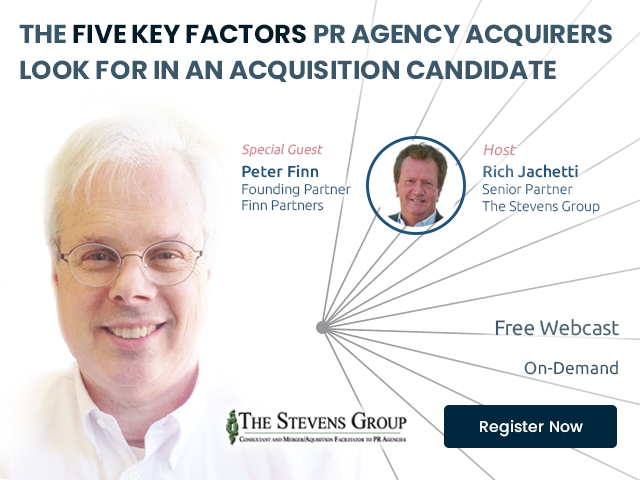 Further, Peter shares what are in his opinion as one of the most methodical buyers of PR agencies in the US, the five key factors that any PR agency buyer is most likely to look for in an acquisition candidate.